Here’s a list of places we checked out and recommend (strictly a summer guide; a lot of roads and stores may be closed in winters). 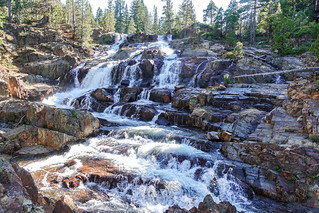 Lower Eagle Falls: They’re on the east side of CA-89 N, a mile further from the Inspiration Point. Park at the Eagle Lake Trail Parking, and cross the highway to get to the lower falls. 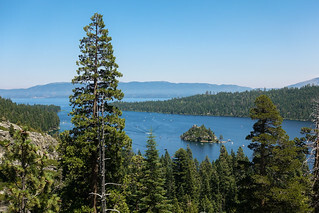 They’re scenic and provide another viewpoint of the Emerald Bay. You need to be very careful with your footing in the water and on the rocks here because this part is on the side of a cliff. 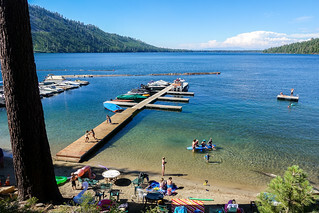 El Dorado Beach at Lakeview Commons: This is a great public beach on Lake Tahoe Blvd, with free public parking (limited spots), public restroom, and picnic tables. It is a great spot to view the beautiful, snow-covered Mt Tallac on the west. A flight of stairs provides access to the beach. Like on a lot of other beaches, water sports gear is available for rent here. 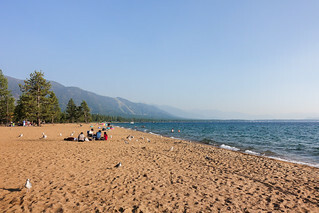 This beach is also in the vicinity of many restaurants on Lake Tahoe Blvd. Fallen Leaf Lake: We visited the southern shore, where the Fallen Leaf Lake Store (referred below in the Coffee section) is also located. The lake is gorgeous. 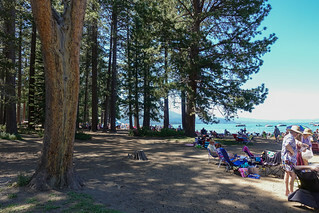 The beach here is much less crowded than any of the beaches on Lake Tahoe, but it is also very small. Parking for this lake is free with limited spots. The key to getting here is to not get intimidated by the single-lane, potholed road. Sadly, the road does not loop around the lake; only one way to get in and get out. There is a restroom at the store. Glen Alpine Falls: These falls are a treat for all the senses – truly magnificent. 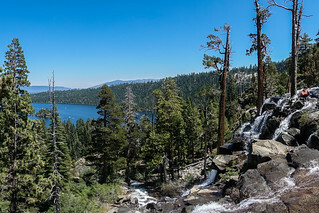 The falls are just a half-mile drive from Fallen Leaf Lake Store, past a fire department. The road to these falls is in poor condition. There is no designated parking at the falls. Nevada Beach: Here’s the official link for this beach. Parking is $8 for day use (or you can park on Elks Point Road and walk to the beach). A wooden walkway to the beach ends at a bench. 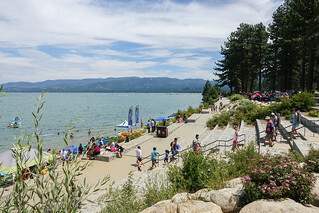 This beach offers scenic, panoramic views of the lake and the surrounding Sierra Nevada range. 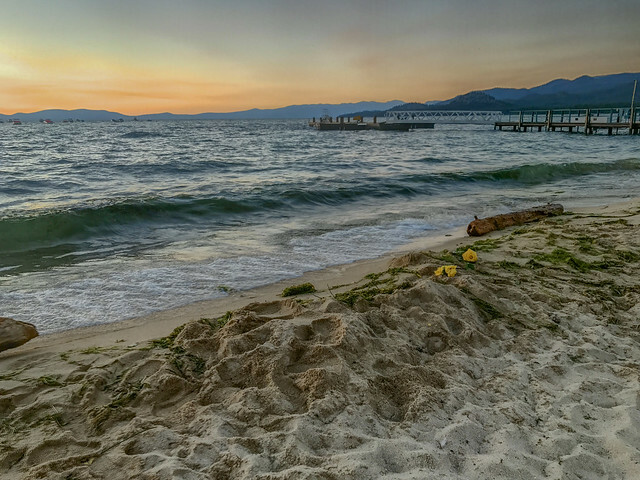 Kings Beach State Recreation Area: Situated on the northern shore of Lake Tahoe, this is another good spot to slump yourself for the day. A lot of restaurants and cafes are within walking distance from the beach. The beach has pay-to-park parking lots (up to $10) and public restrooms. The parking lots invariably run out fast. We parked somewhere on Chipmunk St, which had a few free public parking spots. This is the official website. 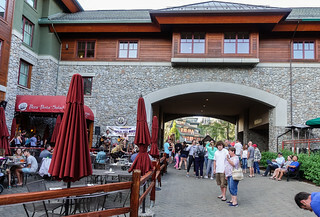 Ski Run Blvd: We chanced upon this interesting place while looking for coffee. 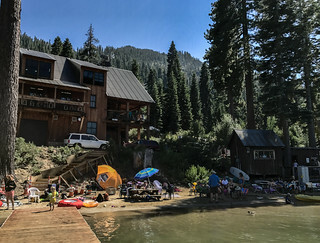 At the end of the Ski Run Blvd, there are a couple of restaurants (Artemis, referred below in Dining Options) and cafes and the spot provides easy access to a small and peaceful beach. In fact, we liked the place so much that we returned here on our last night at Lake Tahoe. This is also the place where Safari Rose starts its daily cruises. There is a parking meter for the lot (ample space) and you pay at the kiosk before leaving. Camp Richardson: This site provides lodging, camping, resort stay, and marina. The beach access is public. Entering their premises and parking (Jameson Beach Rd) costs $10 (cash). Once here, you can spend unlimited time at the beach, drink and dine (Beacon Bar & Grill, referred below in Dining Options), or indulge in water sports. Base Camp Pizza Co.: We did not like the pizza we ordered – “Base Camp”; probably better luck next time with this place. They have a bar and offer live music. California Burger Company: Burgers and salads were quite alright. Their sidewinder fries were interesting. They have indoor and patio seating and live music. 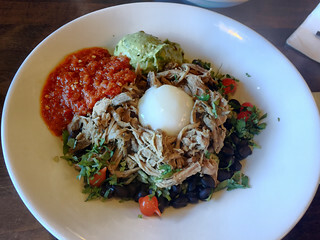 Azul-Latin Kitchen: The food here was surprisingly delicious. They have indoor and patio seating. Rocky Mountain Chocolate Factory: This is a very interesting place to try out chocolates in a variety of forms. Beacon Bar & Grill: The location overshadows the food and drinks, which is not too bad either, though I thought my Rum Runner was too slushy. Beware, the wait time to be seated can run up to an hour (we parked ourselves at the adjoining beach in the meantime). 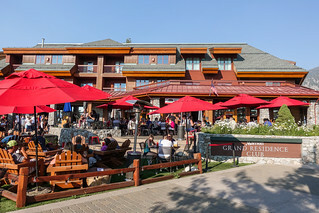 And because their lakeside restaurant has such a relaxing view, which when paired with food and drinks, can really make you lose track of time, they have a deck limit of 90 minutes. 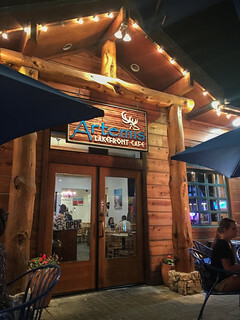 Artemis Lakefront Cafe: We liked the food here the best in this trip to Tahoe. It also has an excellent location, next to the beach and marina. Watch the sun set and then head over here for food and drinks. 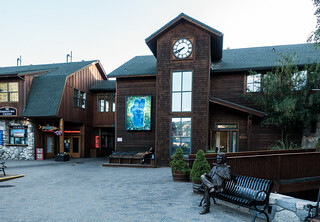 Bear Beach Cafe: The menu options are similar to Denny’s. The food was delicious, in line with the reviews and ratings. 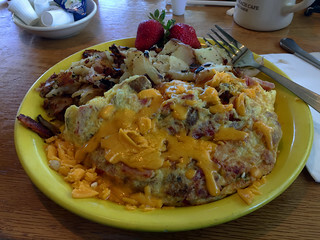 Only word of caution – portions are huge. A single meal can be quite sufficient for two people. Char-Pit: It is a popular, non-fancy place with good burgers. Offers indoor as well as outside seating. Tahoe Time Ice Cream: Nothing outstanding about the ice cream itself other than the fact it is close to the beach. What better way to spend time on the beach than licking a scoop. Fallen Leaf Lake Store at the south shore of Fallen Leaf Lake: There is a cafe inside the store, which offers coffee and some food selection (costs are on the higher side). The cafe provides a perfect balcony view of the beautiful, serene, and quiet lake, that pairs wonderfully with a hot cup of coffee. 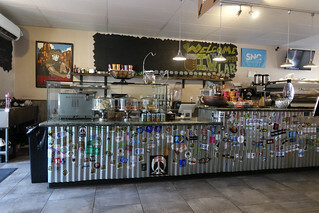 Unfortunately, Google Maps does not list the timings of the store and cafe and there is no entry for the place on Yelp.